Raita is a yogurt salad popular in Indian cuisine. Designed to be a a cooling counter-balance for many spicy Indian dishes, like Pork Balls in Curry Sauce or Bombay Pork Skillet. Reduce the calories by using low-fat or nonfat plain yogurt. In a small sauté pan, toast cumin seed over high heat, stirring constantly; remove from heat, allow to cool slightly, crush and place in a small bowl. Stir in corn and rest of ingredients until well blended and serve. 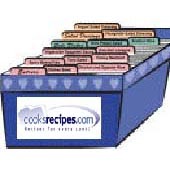 *1 cup canned corn niblets, drained or 1 cup frozen corn niblets, thawed and drained may be substituted. Nutritional Information Per Serving (1/4 of recipe): Calories 60 calories; Protein 3 grams; Fat 1 grams; Sodium 105 milligrams; Cholesterol 0 milligrams; Saturated Fat 0 grams; Carbohydrates 11 grams.